Working alongside chef Richard Sandoval, Perfetti Hospitality signed Pan-Latin concept Toro Toro on the ground floor of Jumeirah at Etihad Towers. The restaurant is expected to open in February 2017. Toro Toro will offer a twist on the contemporary Latin experience by artfully blending Pan Latin flavours and creative sharing plates. Phil Blizzard in Dubai reports on the announcement by Dubai Holding that Gerald Lawless, Jumeirah Group President and CEO is to depart to a new post. Having held the helm of the Jumeirah Group for 18 years the transition will see Mr Lawless taking up a new position in Dubai Holding’s Corporate Office. Maria Dakova, assistant communications manager, Jumeirah Etihad Towers speaking to Breaking Travel News at the Four Seasons Resort Dubai following the World Travel Awards Middle East 2015. 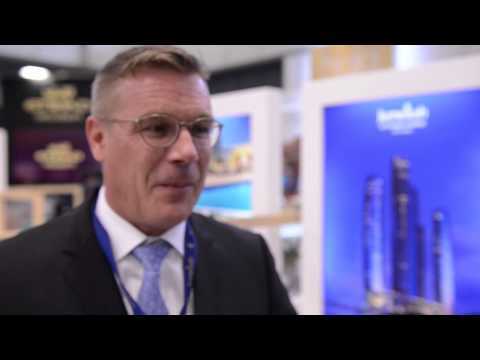 Stefan Fuchs, general manager, Jumeirah at Etihad Towers talks to Breaking Travel News at ITB 2015. Jumeirah at Etihad Towers, a member of the global luxury hotel company Jumeirah, has officially opened Abu Dhabi’s latest luxury attraction: the Observation Deck at 300. The 360-degree panoramic views from Tower 2 of the Etihad Towers complex, located on Level 74 at 300 metres above the nation’s capital, offers an uninterrupted bird’s-eye perspective of the city’s skyline, the Corniche and Arabian Gulf. World Luxury Fashion Week has made its much anticipated debut in Abu Dhabi and is set to become an annual fixture for the UAE capital city. The event brings together some of the world’s leading high-end fashion brands over a four day invitation-only fashion week hosted at the spectacular Jumeirah at Etihad Towers. With the first anniversary of its opening fast approaching, Jumeirah at Etihad Towers has already carved itself a niche among the leading properties in the Middle East. Here Breaking Travel News chats with general manager Doris Greif at the World Route Development Forum about what the future has in store for the iconic location. The International Air Transport Association, will hold its second World Passenger Symposium on October 16th-18th at the Jumeirah at Etihad Towers Hotel in Abu Dhabi, United Arab Emirates. The Symposium is expected to attract more than 600 key air transport stakeholders from airlines, airports, the supply chain and governments, from across the globe. On the back of his recent appointment as hotel manager at the award winning Jumeirah Emirates Towers, Dubai, Imran Changezi sits down with Breaking Travel News during a flying trip to London to discuss the property’s recent rennovation, his priorities for next few months and why he thinks the future is still bright for Dubai.